How are monsters getting childcare jobs? The regularity with which instances of brutality towards their wards by nannies and caretakers at kindergartens are coming to light is as frightening as it is horrific. It indicates a deeper social, psychological malaise that neither we, as parents and adults, nor authorities, as policymakers and law enforcers, seem to have taken cognizance of. No social worker, psychologist or other expert has come forward with credible explanation or analysis of the problem, which seems to go beyond the crime-punishment-deterrent paradigm. President Trần Đại Quang this week called for an extensive examination and inspection of compliance with laws at preschools, kindergartens and children’s groups throughout the country, in order to prevent and strictly handle violations committed against children. The request was made following the latest exposure in a series of exposures of child violence and abuse in preschools across the country. 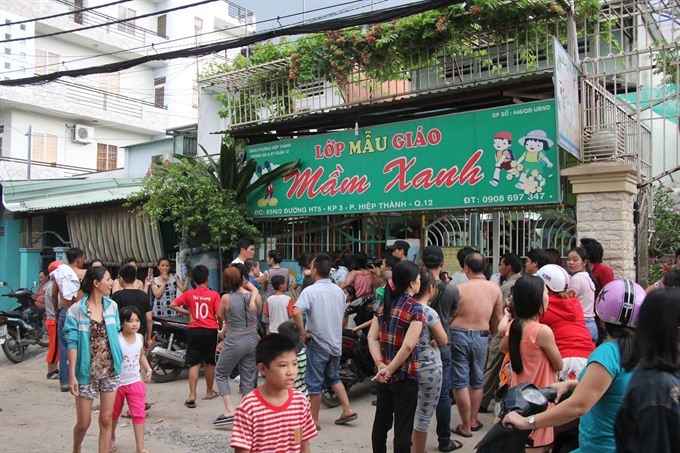 Three caregivers at the Mầm Xanh Kindergarten in HCM City were seen to slap the faces of toddlers aged 3-5, hit them on their backs and heads, and even throw children in the air in anger. Earlier clips have shown some preschool teachers or caregivers brutally smacking, beating, hitting the kids with their hands, spoons and even a knife. Not surprisingly, most the kids that are subjected to such brutality come from low-income families who can only afford small and private kindergartens, many of them illegal. The reactions of the authorities – examinations, inspections, reviews, tougher laws and punishments – are needed, but they are predictable and fall short of the kind of diagnosis that is warranted. Nguyễn Thị Thu, Vice Chairwoman of the HCM City People’s Committee, called an urgent meeting and announced that the city would launch a US$6 million, five-year (2017-2021) project to develop a child-friendly city. She also said that all kindergartens will be required to install cameras. Apart from the effectiveness of this measure, which is in itself questionable, how does it address the question of what makes people so cruel to children, and how were people prone to such cruelty given charge of the defenseless children? Deterrence based on fear of exposure and punishment cannot answer the question of what leads to such behaviour in the first place. Can security cameras detect cruelty, frustration, anger or whatever craziness causes people to be so cruel, and to children, no less? The physical and mental toll that such behaviour will have on children, those who directly suffer the pain and those who are forced to watch it, cannot be understated, and their future impacts can hurt our society seriously. It is not enough that the violators are punished. They need to be studied, in depth. What are the factors that prompt such cruelty among otherwise ordinary people? Seeing such behaviour as exceptions, not the rule, just won’t do. One root problem in the education sector is recruitment of the right people for the most crucial job of educating our future generations. Clearly, people capable of such heartlessness and brutality are not cut out for nurturing young children. Why are they opting for this job and why are they being hired? How can empathy and love for children be discerned among job applicants? How can the maturity to draw the line between discipline and a child’s natural proclivity for fun and frolic, which are absolutely its birthright, be assessed? On paper, the education ministry’s requirements for preschool teachers seem to be sufficient and adequate: they are required to love children and have the skills to teach them in a systematic manner. It might be that preschools are seen as places where children’s physical needs are taken care of – food, cleanliness, etc., rather than spaces where serious, formal education takes place. This is an obvious fallacy that also needs to be nipped in the bud. According to 2016 statistics complied by ActionAid on public spending on education, health and public transportation, the proportion of State Budget allocated for preschool and general education is just 8.2 per cent compared to 28 per cent for primary education, 21.6 per cent for secondary education and 11 per cent for high school. Education minister Phùng Xuân Nhạ once admitted that investment in facilities and teachers for preschool education was still limited. The shortage of preschool teachers is rampant in many localities. Some education experts have cited the lack of a master plan for preschool development. But the first realisation should be that teaching is not a job for everyone. Carl Jung once said children are educated by what the grown-up is. He also said that just as you can’t grow a tree in a place lacking light, you can’t raise a child up with just a little love.